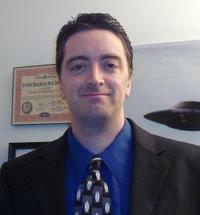 Dr. Brian D. Parsons is an author, public speaker, and anomalous researcher and investigator. He created the "E4" Method of client-based ghost investigation in early 2012. He founded the Ohio Paranormal Investigation Network (O.P.I.N.) in late 1996 which survived until 2011 with the group's former website now surviving as an educational site for clients, researchers, and investigators and is simply known as Ghost Help. Brian is the Executive Director of the ParaNexus Anomalous Research Association, is a member of the Pennsylvania Cryptozoology Society, and is the host of the Paranormal News Insider heard on the Paranormal King Radio Network every Tuesday night at 8 pm eastern. To ask Brian D. Parsons questions, please sign up. Brian D. Parsons hasn't written any blog posts yet. While everyone seems to like pirates I have been fascinated with their culture as well as the culture of discovering their past including wreck diving. I have been fortunate to have visited Key West and learn about wreck diving and salvage as well as While everyone seems to like pirates I have been fascinated with their culture as well as the culture of discovering their past including wreck diving. I have been fortunate to have visited Key West and learn about wreck diving and salvage as well as visit the Pirate Soul Museum before it move to St. Augustine. Visiting other islands in the Caribbean gives you the opportunity to hear other stories about ships you just can't Google. One of my favorite books was "Pieces of Eight: Rediscovering the Riches of a Lost Spanish Treasure Fleet" by Kip Wagner told by L.B. Taylor, Jr. This book was printed in 1966 so it's pretty hard to come by but not impossible. It chronicles the early days of discovering wrecks which I found fascinating especially after hearing about the search for the Atocha and being able to hold treasure recovered from the wreck discovered by Mel Fisher after losing family members during the search. We’d love your help. Let us know what’s wrong with this preview of Paranormality by Richard Wiseman.